Numbers never lie, bankers often do. So maybe it’s time to stimulate the economy by building bigger jails? Another day, another banking scandal. 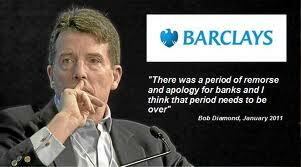 Barclays share price declined 75% under Bob Diamond, Worth the 100+ million he was paid? Barclays’ LIBOR cheats exploited an arcane and out-dated rate-setting mechanism to fix rates in their favour – which means to your detriment. Just think for a moment what that means. Don’t think about the financial implications of these things. Think of the human ones. Innocent victims being shot up, because HSBC helped enrich a drug gang. The loathsome regime in Syria evading sanctions thanks to HSBC. In Mexico alone, some 50,000 people have been killed due to drugs-related violence over the past 6 years. You can’t blame the bank for all of that, but they were complicit. Oh boy, were they complicit. We understand how this story runs now. There’ll be some huge fine. A billion dollars, perhaps? If so, that seems too little. A couple of people will lose their jobs. Someone, maybe, will give up a bonus. There’ll be stern words from senior management about culture change, the need for stricter compliance, external audits and the rest. But, really, haven’t we heard all that before? Apart from anything else, Dutch bank ING has admitted to violating US Economic sanctions and paid a fine of $619 million. And despite every fine, every disclosure, every new set of apologies, the fundamental culture of banking hasn’t changed at all. It’s worse now than it was 10 years ago; worse then than it was a decade earlier. And there’s one giant question which still needs to be answered: why is nobody in jail? Why are there no bankers in jail? If you personally went and did what you could to assist the Assad regime in Syria and helped provide arms to Mexican drug traffickers, I suggest that you would – and should – spend much of the rest of your life staring out through barred windows. The simple fact is that we haven’t got to grips with our banking system and nothing – nothing – that is happening today indicates any real toughening in our regulator’s approach. The solution remains simple and the same as in my book, Planet Ponzi. For every million dollars that banks fiddle, or manipulate, or launder, or miss-sell, one banker should spent one year in jail. And recall that HSBC laundered billions. We can stimulate the economy by building bigger jails.